How Do Fraudsters Steal Your Important Information? In today's world, information flows from hand to hand at the drop of a hat. Even though businesses use some of the best security protocols, there are countless ways that fraudsters, hackers, and thieves can steal your credit card info, identity, and other valuable information. Here are some of the most common ways thieves can get their hands on your personal information -- and how to stop them. Phishing is a type of email scam that prompts the victim to share valuable information. The fraudster will send out emails and other links by posing as a real website or legitimate-looking company, fooling many in the process. They may do so by requesting you click on a nefarious link, goad you for your credit card information, or reply with log-in information for an external site to steal your password. If you ever get an email from an unknown source, don't open it. You should also be wary when a legitimate-looking email requests your personal information or contain typos. This means that it could be a thief who wants to steal your valuable information. Report this email to your email provider to stop the criminal in their tracks. Online information is exceedingly valuable and if you make purchases on public wifi providers, you may be opening your bank account for numerous hackers in your area. Coffee shop hackers and cybercriminals will target public wifi systems to garner information, including credit card numbers, personal emails, and more. Others will even target electronic signals from your devices even if you're not connected to the internet. The best thing you can do is avoid using public wifi sources when you're out on the town. If you suspect someone is up to dastardly deeds, turn off your devices to stop signal transmissions. A recent study performed by the National Telecommunications and Information Administration found that nearly 50% of American internet users refrained from online activities in the name of privacy and safety concerns. One of the most tried and true way of stealing information is intercepting mail before it gets to your house. 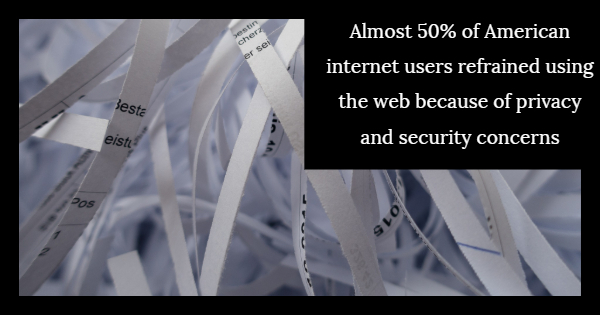 Some hackers will even dig through your trash to lift important information from the seemingly harmless junk mail that was thrown away and other documents that weren't properly run through an industrial shredder machine. Whether you're throwing away pieces of junk mail or government documents, the best way to stop thieves is through the use of a high capacity paper shredder with the best security measures on the market. Secure paper shredding assures that the information on your documents can never be pieced together and fall into the wrong hands. A commercial paper shredder is the best way to protect yourself, your business, and your employees. For the best in high capacity paper shredders, rely on Capital Shredder to protect your valuable information. Our high security paper shredders ensure that your information is impossible to lift by would-be thieves and hackers. Now that the 2018 tax season has begun, provide added security to your home and business with a high capacity paper shredder.